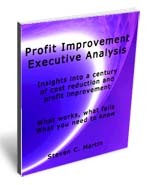 Author: Steven C. Martin, a business owner and manager with over 40 years of proven cost reduction and profit improvement results. Description: e-book delivered via email in PDF format. Current edition 187 pages 8.5 by 11" format. Printable. Style: Thirteen easy to read chapters begin with business stories illustrating applied cost reduction and profit improvement principles. The last half of each chapter delivers tools, methods and suggestions for ready use. Description: e-book delivered via email in PDF format. Current edition 157 pages 8.5 by 11" format. Printable. 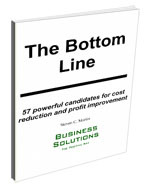 Style: Twenty six chapters written in an instructional format covering the fundamentals of what it takes to design, install and manage a continuous improvement program delivering cost reduction and increased profits. Learn how to engage management and employees for maximum sustained results. Description: e-report delivered via email in PDF format. Current edition 9 pages 8.5 by 11" format. Printable. Description: e-book delivered via email in PDF format. Current edition 40 pages 8.5 by 11" format. Printable. Content what you need to know about Six Sigma / Lean, cost reduction, continuous improvement programs and profit improvement programs and assist in your decision making. A detailed review of over 100 years of published results and current field experience. 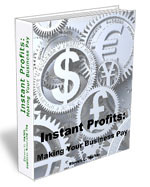 These books are loaded with rich content and are NOT available anywhere else but here. A note about E-books: We started offering all of our books and reports in electronic format in 2008 when the price of shipping finally became so high particularly internationally and the delivery times became longer. We have always used limited print runs and print-on-demand in order to manage inventory costs and to allow us to keep the content fresh with annual updates. The conversion to electronic editions allows for delivery within 24-48 hours across any borders and we can and do update the content continuously. 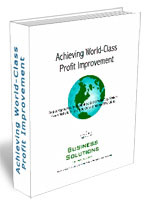 We pass the benefits on to you in the spirit of cost reduction and profit improvement.